Arrive at Entebbe airport where an Aerolink member of staff will assist you with the check in and transfer to your 07:45am (arrival 10:05am) or 12:30pm (arrival 14:35pm) domestic flight to Kasese, check in time is one hour before the flight. 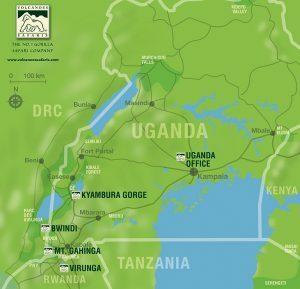 In Kasese you will be welcomed by your expert guide who will provide knowledge and assistance throughout your journey. In the afternoon, explore the Bigodi Wetland Sanctuary. The reserve is abundant with butterflies, plants, animals and, in particular, birds. Spectacular birds like Great Blue Turaco and rare Papyrus Gonolek will be of great interest to birders. The swamp is also home to more elusive animals such as Red Colobus monkeys and Sitatunga antelope. Depart for Queen Elizabeth National Park. En route, take a short walk in the foothills of the Rwenzori Mountains and take in the views of this magnificent mountain range. Alternatively, drive straight to the park and take a game drive. What you see depends on the season, but the Kasenyi plains are excellent for sighting lion and large herds of Uganda kob. The Mweya peninsula is one of the best places to look for leopard, which live in the dense, scrubby thickets. Time permitting, visit the Kyambura Women’s Coffee Cooperative and its coffee processing station or the wetland reserve to spot birds. Both projects were set up and are run by the Volcanoes Safaris Partnership Trust (VSPT). The Kyambura Gorge is an extraordinary natural environment and forms a stark contrast to the surrounding grasslands. Here you can track one of our closest animal relatives: the chimpanzee. The chimp population is quite mobile and viewing can be unpredictable but the walk itself is enchanting. In the afternoon take a cruise on the Kazinga Channel, which flows between Lakes Edward and George. Kazinga is home to one of the greatest concentration of hippo in Africa and herds of elephant, buffalo and other animals come to drink at the waters edge. The channel is a magnet for waterbirds, with great flocks of pelicans and others birds on the shore, and a great spot to see African fish eagle. Also in Kyambura Gorge you can visit various community projects from the Volcanoes Safaris Partnership Trust (VSPT) including: Women’s Coffee Cooperative Tour, Reclaimed Wetland Tour, Bee-Keeping Fence Visit, Omumushaka Dance Group Performance, Empundu Playground Visit and much more. Your safari now continues to the primeval Bwindi forest. Travelling via Ishasha – subject to road conditions – you can observe the unusual behaviour exhibited by the tree-climbing lions. The long journey through the rapidly changing landscape takes you to Volcanoes Bwindi Lodge, which looks across to the towering trees of the forest. Depending on when you arrive, there maybe time to explore the lodge grounds with its clear mountain stream or visit the local village. You can also visit the Bwindi bar a VSPT project located just 3 minutes from the lodge. They serve chilled drinks and delicious snacks at pocket friendly prices. A few minutes at Bwindi bar will give you an insight in what life in Bwindi Community is like. Walk through the local village, and learn about community life and Bwindi Community Hospital that started as a health clinic under a tree and now provides vital medical and educational services to over 60,000 people. Also take a tour of our local tea processing operation at the lodge which enables guests to see the various different methods for tea growing and at the end of the tour taste some of our own grown tea! The Volcanoes Safaris Partnership Trust supports both projects. Discover the traditions of the Batwa Pygmies, and learn about the native tribal inhabitants of the forest. The indigenous people of Bwindi forest, though no longer resident in the forest, still practice many of their traditional hunter-gatherer skills. Transfer from Bwindi lodge to the Kihihi airstrip. Leave with the 09:45am (arrive at 11:25am) or 14:05pm (arrive at 15:55pm) return flight to Entebbe and connect in time for your return flight. The eclectic contemporary Kyambura Gorge Lodge has been converted from an old coffee processing plant and has incredible views overlooking the Queen Elizabeth National Park, the mythical Mountains of the Moon in the far distance.